This post will absolutely contain spoilers for Episode 6.14 of Lost, "The Candidate." Be forewarned. I'll count it down the way we used to do on Usenet, just in case. In a comment on my last post, Wendy asked the important question: What about Lost? We watched it on my birthday getaway, and then I watched it again with LP last night. As a person who thinks drowning is about the worst way to die she can possibly imagine, I found it hard enough to watch the first time. The explosion on the sub, the water blowing back the door against Lapidus, the limited canisters of oxygen, the injured compatriots, the idea that Hurley would bring Kate to the surface (! ), the irony that Jack had to rescue Sawyer, whose lack of trust brought them to this pass, all that was enough. Except that it wasn't, and there was Sun, so beautiful, trapped in the rising water. And even as my spouse said, "She has to tell him to leave, to take care of their daughter," I knew there was no way Jin would leave her there alone to die. Fans of the show on the Internet–well, fans other than this one–griped that they were reunited only to be killed, howled that Jin left his daughter to be raised by the horrible parents of Sun, decried the scene as cheesy, really just generally went ape over the turn the plot took. I saw in my getaway hotel room, hand lifted in the air, saying, "I am holding onto the idea that the timelines will merge, that we will see them together again, that in the other reality she is pregnant with that daughter. I am holding onto that." I said it, hand in the air, gathered into a clasping posture, because although I have expected tragedy and loss in this fight between good and evil, I want to believe that these benighted people will be redeemed and released and live on "in anotha life, brutha." One of the things I find compelling is the way the flash sideways and the island story, too, are revisiting phrases and motifs from the first five seasons and turning them upside down. One of the skills we learn in seminary, hopefully, is theological reflection, an exercise that asks us to consider what's happened in light of holy texts and pastoral experience and psychological understanding, to look at things from the obvious angle but to turn them around and look at them a different way, too. Since Season One, we've heard the refrain, "Live together, die alone," first from Jack in a speech on the beach to the other Lostaways. But watching Sun and Jin, in the flooding, sinking sub, I said aloud, "Die together, live alone." The whole purpose of the two of them has been to work through their conflicting impulses to come together and then to separate, to respond to the outside pressures and the mechanical difficulties that threatened them (a nasty father doing dirty business, the class divide, infertility) by recognizing that ultimately their love mattered more than anything else. I don't know if they are pieces in a game, the characters in our story. Maybe they are being played, or maybe they are simply being set up to play. For most of us, in everyday reality, we would want to see the father swim away to be with the child, bereft, yes, but devoted to the representation of his love for his wife that exists in their daughter, just as the wife had been in his absence. But this is not everyday reality. This is a story about LOVE, and how love makes us good, how love makes us able to sacrifice, how love breaks through in unexpected ways and allows forgiveness and redemption. I'm afraid it's no guarantee of a happy ending, though I hope for some version of one. My current working theory is that the flash sideways is an alternate reality jimmied together somehow by Eloise Hawking (Widmore) to save her son's life. To try and keep the other people impacted by the island quiet, she has given many of them things they wanted, at least as she understands and interprets those things. But it's all to serve her own purpose, and her own happiness, and her own love for the man she shot in cold blood before she even gave birth to him. She's doing all this at the same time the island is still playing out its latest dramatic creation, at the same time her son's father is on a mission of his own. He's just as ruthless, but is he driven by love? Can love drive us to be ruthless? Desmond is still down the well, his life preserved by the question he asked Sayid: If you get to see the woman you love again, how will you explain it to her? Can we really get what we love by being bad? Won't it backfire on us? I think of Sayid much as I do Sun and Jin. Having done the loving thing in the Original Timeline, he's created some benefit for his other self, the one just arrested, the one who killed to protect his true love and his brother and their children. He's good and bad, but he's driven by love. And on the sub, with the explosives, he does good through ultimate sacrifice, which was prefigured by his cruciform body being carried from the pool in the prior episode in which he died. So, I'm over here holding onto hope, despite the sadness of this week's episode, despite hearing my daughter sob over Sun and Jin, sob with Hurley on the beach. I don't like Kate, and never particularly wanted to see her with Jack or Sawyer, but the embrace between Jack and Kate on the beach touched me. They're all in this predicament because Sawyer could not trust Jack; I'm eager to see how his story plays out, probably more than any of the other original Lostaways now. I don't think the timelines will merge per se, but I hope we'll see people who ought to be together, together, in the other timeline. And I suspect we will see Jack on the beach with Faux Locke, the new force for good, trying to keep the cork in the bottle. I welcome your thoughts and theories in the comments, even if they don't line up with mine. I knew I could trust you, though I didn’t expect quite such a thorough and eloquent answer to my question. I don’t have a lot to add to what you’ve said, but I, too, am counting on the sideways universe to give us some sort of happy ending. And I thought Jin and Sun dying together was quite beautiful even if I did cry. It didn’t bother me at all to have them killed off just after they had reunited because they HAD reunited. If it had happened just before–then that wouldn’t be Lost. I kind of thought Sawyer would the one to die, but I think he has some trust issues to still work out in his redemption. I suppose it will be Sawyer, Kate, and Jack to the very end. Since Juliet is gone (and even though that came out of nowhere, I totally fell for them and can’t see Sawyer with anyone else) I still think he is going to die at some point, but Officer James Ford will have his coffee with Juliet yet (I hope). I think they have set it up for us to think Jack will be the next Jacob which makes me wonder if they will pull a last minute switch–something along the lines of Jack sacrificing himself at the last minute for Sawyer or Hurley. I don’t think they’ll do that, but it’s possible. ok, havent seen this yet, but enjoyed reading it still – I like to know what’s coming. But mostly, OMG!!! Usenet! I havent thought about that in a THOUSAND years! Awesome. My DVR cut off the very last scene . . . just as Kate and Hurley emerged from the sea. GRR! I share your interpretation of what this story is about – at times an episode or scene will capture perfectly my understanding of what God’s LOVE is. I think this series could make a great youth/adult or even a “seekers” discussion! I’ve never gotten the “Kate dislike” you share with many other Losties, although sometimes the whininess of Kate/Jack/Sawyer grated on my nerves. I wish for and have hope that whatever the ending is, it is satisfying, even if it’s not all happy. I wish good things for Hurley especially. This will be a tangent, but I have to say that I don’t like how the show handles the idea of “trust.” Characters are always saying, “I don’t have time to explain. Just trust that my crazy idea is right.” Of course, often the crazy idea is wrong, even if the character was well-intentioned. The characters are mostly loners and they never seem to sit down and talk through things and pool their ideas and knowledge. I keep thinking we’re going to see the characters grow and change and learn to work together, but so far that hasn’t really happened. I don’t like the idea of “trust” being this blind trust that some other human being has the right answer. Why would they? It’s a pretty dysfunctional version of trust. To me, learning to trust has always been finding people who are willing to talk openly about their ideas and listen to mine and work together. The show really doesn’t model that at all. I think Hurley is only character who consistently tries to do the right thing, the unselfish thing, so I keep thinking the ending has got to involve him in some significant way. The other characters keep behaving badly, then finding redemption in some way, but he seems to be the stable person who knows right from wrong. And he can talk to dead people, which has got to count for something. 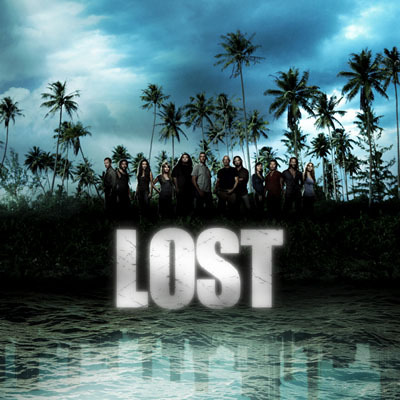 What’s really cool is – whatever the ultimate outcome of the series – Lost is getting viewers to think, philosophize and ponder complicated theories. Each week a publicist sends me his client’s take on that week’s episode of Lost. The client has written a book about religion in Lost that I bet will pop up on Songbird’s reading list one day very soon.